Check your balance, make transfers, review account activity and more – all from your mobile phone! Already enrolled in mobile banking? Smartphones have become essential to everyday life, and United Southern Bank is pleased to have a convenient tool to help simplify your banking needs. We took into account all of the services that our customers need and use, and integrated them into an app designed to optimize a smartphone’s capabilities for banking. With Snap!App your mobile banking will never be the same. After you download the app, all you have to do is setup and verify your account. The only thing you will need in order to set up Snap!App is your current online banking information. Once your account is linked to your Snap!App you will be able to see the information in your online banking accounts, your recent transactions, and even transfer funds. Note: If you are new to internet banking, you will be required to answer credit related questions to verify you and your account before using your new mobile banking app. • The first is mobile card deactivation. If you lose or misplace your United Southern Bank card, you will be able to turn off your card directly from your mobile device. No need to call USB, you will have the power! Once you find your lost card, reactivating it is a simple as touching a button. • The second feature is all about simplifying your life. 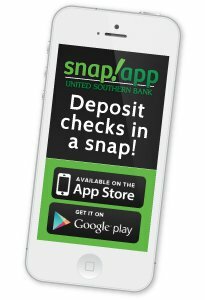 Once you have Snap!App you will be able to deposit checks into your account, directly from your phone, simply by taking a photo. All you need to do is open the Snap!App and select deposits. Once you are on the deposits page, you can click on the piggy bank icon and follow the simple directions! United Southern Bank works hard to bring the latest technology and convenience to Hopkinsville, KY and the surrounding Christian and Todd County areas. Life keeps you busy… we make it a little easier. Download Snap!App for your smart phone today! Available for Apple Products and Android Devices.